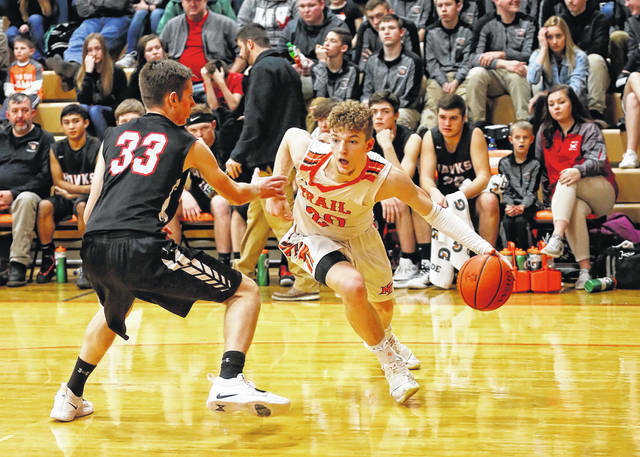 National Trail’s Zach Woodall played a key role in the Blazers 51-32 win over Mississinawa Valley on Friday, Feb. 8. NEW PARIS — National Trail’s boys basketball team improved to 18-2 on the season with a pair of victories last week. Trail opened the week with a 63-38 win at Newton on Tuesday, Feb. 5, then closed out the week with a 51-32 win over Mississinawa Valley on Friday. Against Newton, Hunter Michael had 18 points and 10 rebounds, Zach Woodall 13 points and 8 rebounds, Cameron Harrison 12 points and 9 assists, and Travis Hunt 11 points and 5 assists. The game was tied at 19 with about 3 minutes left in second quarter when Harrison hit a 3, then Hunt hit a 3, during a 7-0 run for the Blazers. Trail the went on 15-4 run to start the second half to push lead to 41-23 late in the third quarter. “Although I was not real pleased with our first half, I thought the kids did an exceptional job in the second half getting the things done that we wanted done. Effort and concentration was at a really high level, which was exciting to see again,” Trail coach Mike Harrison said. Against MV, Cameron Harrison had 12 points, Zach Woodall, Travis Hunt 11 each, and Adam Eyler 10. Hunt scored 9 of his 11 in the third quarter where Trail pulled away a bit with a 17-7 quarter. 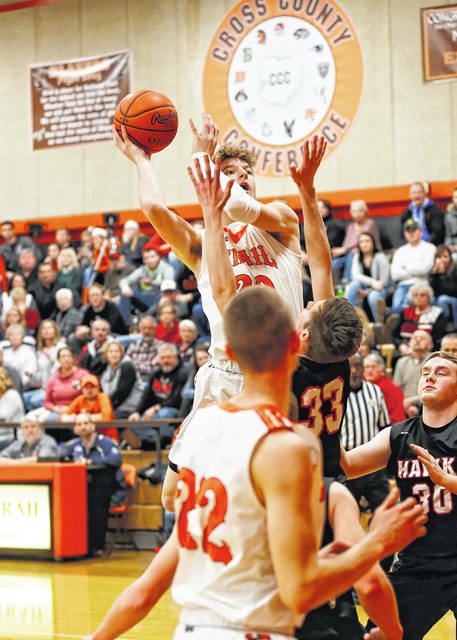 “Travis, along with fellow seniors Adam Eyler, Hunter Michael, Evynn Short, and Josh Bishop, all contributed while playing in the final home game of their careers,” coach Harrison said. Coach Harrison said the the seniors have grown during their four years. 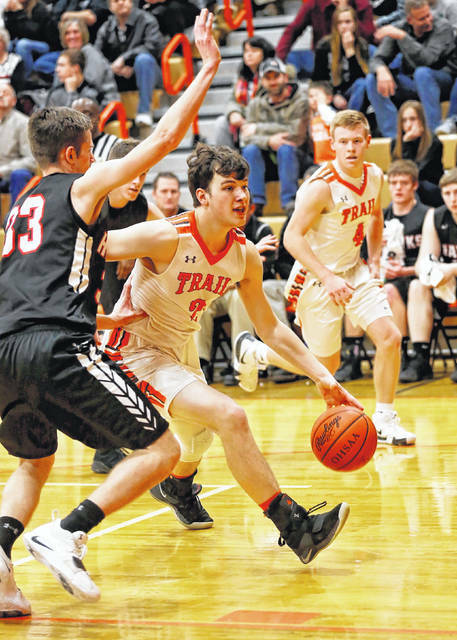 Trail was scheduled to play Middletown Madison on Tuesday, Feb. 12 then will close out the regular season with a trip to Franklin-Monroe on Friday. 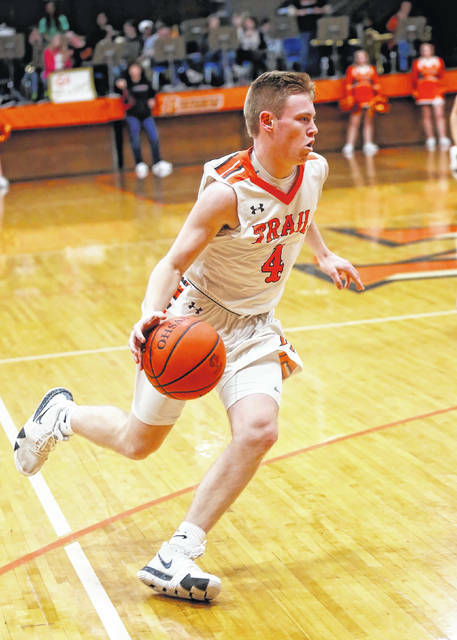 https://www.registerherald.com/wp-content/uploads/sites/41/2019/02/web1_NT-VS-MV-2.jpgNational Trail’s Zach Woodall played a key role in the Blazers 51-32 win over Mississinawa Valley on Friday, Feb. 8.